Dayyan of Smyrna; almoner and preacher; died 1729. Elijah produced over thirty works, of which the principal, according to Wunderbar ("Orient, Lit." p. 579), are as follows: "Midrash Eliyahu," eleven funeral sermons and a commentary on the Talmudic sayings relative to the Roll of Esther (Constantinople, 1693); "Midrash ha-Izmiri," homilies (ib. 1695); "Midrash Talpiyyot," glosses and comments taken from three hundred works and containing 926 (the numerical value of the word "Talpiyyot") paragraphs in alphabetical order: only the first part, from "alef" to "kaf," was published (Amsterdam, 1698); "Me'il Ẓedaḳah," a treatise on charity (ib. 1704); "Shebeṭ Musar," on ethics, the best known of his works, divided into fifty-two chapters corresponding to the weeks of the year, and taken for the most part from the "Or Ḳadmon" of Moses Ḥagis, the "Tokaḥot" of the Spanish poets, the "Orḥot Ḥayyim," and the "Roḳeaḥ" of Eleazar of Worms (Constantinople, 1712); "Megalleh Ẓefunot," cabalistic treatises (Porizk, 1785); "She'elot u-Teshubot," responsa (Sudilkov, 1796); "Minḥat Eliyahu," sermons (Salonica, 1824); "Semukim le-'Ad," homiletic treatise on the parashiyyot (ib. 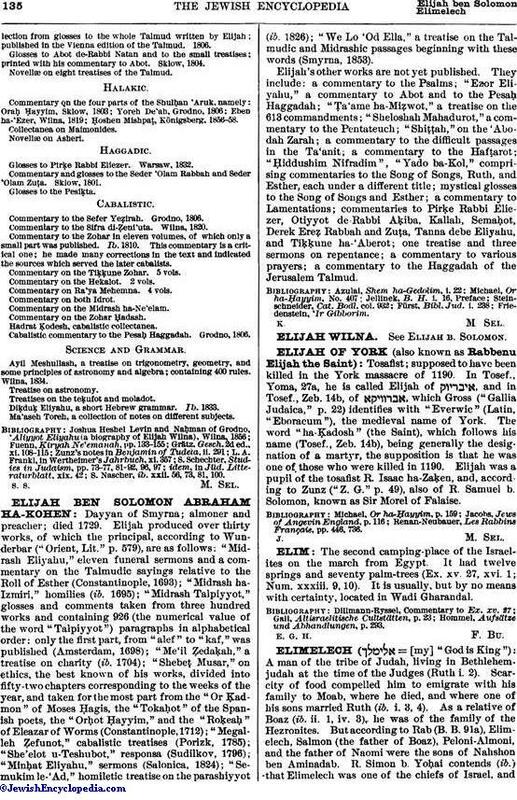 1826);" We-Lo 'Od Ella," a treatise on the Talmudic and Midrashic passages beginning with these words (Smyrna, 1853). Elijah's other works are not yet published, They include: a commentary to the Psalms; "Ezor Eliyahu," a commentary to Abot and to the Pesaḥ Haggadah; "Ṭa'ame ha-Miẓwot," a treatise on the 613 commandments; "Sheloshah Mahadurot," a commentary to the Pentateuch; "Shiṭṭah," on the 'Abodah Zarah; a commentary to the difficult passages in the Ta'anit; a commentary to the Hafṭarot; "Ḥiddushim Nifradim", "Yado ha-Kol," comprising commentaries to the Song of Songs, Ruth, and Esther, each under a different title; mystical glosses to the Song of Songs and Esther; a commentary to Lamentations; commentaries to Pirḳe Rabbi Eliezer, Otiyyot de-Rabbi Aḳiba, Kallah, Semaḥot, Derek Ereẓ Rabbah and Zuṭa, Tanna debe Eliyahu, and Tiḳḳune ha-'Aberot; one treatise and three sermons on repentance; a commentary to various prayers; a commentary to the Haggadah of the Jerusalem Talmud.